Why you Should Have a Separate Web Page for each of your Books is part one of the Essential Elements of an Effective Author Website series. Which website ranks the highest when readers search for your book? For many authors, it’s Amazon, or maybe Goodreads. Some of you may be saying that’s great. My reader can go directly to Amazon and buy the book. That’s what I want, right? Yes, we want readers to buy the book — that’s a given. But not everyone is an Amazon customer. How hard to you want those readers to have to work to find your book? More importantly, If you’re sending your web search traffic to Amazon, you’re helping to cement the relationship between Amazon and your readers. Our goal as authors should be to build adirect link between the reader and ourselves. The best way to form a mutually beneficial relationship with your readers and fans is through your website. Whether you have one book or thirty, whether you write one series or five, each of your books should have its own separate web page. There are a few reasons, but the most important is that it makes it easier for Google to find you and your books. In other words, it’s important for search engine optimization (SEO) purposes. We want readers searching for your name and book title to have your website to come up as the top result. Once they land on your page, you can encourage them to signup for your newsletter, as well as providing them with links to ALL of the different places your book are available online. What should my book page include? There are a few items that are must haves on each separate web page for your books, but before we go there, let’s get technical for a minute and talk about URL construction. That’s obviously a made up link and domain. So here’s a real example of a book page, from Gillian Flynn’s website. Note the author name and the book title in the URL. This link is a simple and straightforward step to improved search engine optimization. There are other items you can add to a book page, but those are the Essential Elements. Click on any of the book links and you’ll see the individual book page. Series pages would also work well for SEO purposes because some readers will search using a series name, rather than book titles. The important thing is to capture as much search traffic as possible at YOUR website, before sending readers to online booksellers to purchase your books. 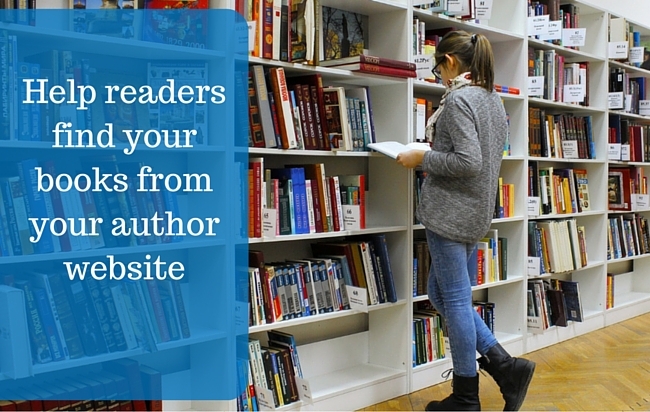 The Essential Elements of an Effective Author Website series continues with a post on your author website’s About page.